With a transitional design with a durable laminate finish in a rich espresso, the Pleasant Hearth Riley media console electric fireplace is sure to be a striking focal point in a living room, family room or bedroom. The 7-inch centre shelf has openings for ventilation and cable/cord management and the adjustable side shelves store media and other small items. The mantel supports flat-screen TVs up to a 48-inch to create a complete media centre. The 23-inch electric firebox plugs into a standard wall outlet and produces a realistic flame and glowing ember effect. It comes with 3 flame settings and 11 thermostatic temperature adjustment that you can control via the LCD back-lit control panel or the included remote control. There is no installation or venting required. Simply plug the unit in and begin enjoying the warmth and ambiance. The McCrea media fireplace combines functionality with fine furniture styling. With it's distinctive design it accommodates TV's up to 55" as well as DVD players and other media components. The side cabinets provides ample storage and easy access. Built in wire management system eliminates the hassle of messy wires and is easily accessible through magnetic back. The electric fireplace heats up to 400 square feet with 4,600 BTUS of fan forced air heat and comes equipped with a 8 stage timer and 13 thermostatic temperature adjustments. The LCD control panel displays your settings, and then locks them into memory. Control the climate from anywhere in the room with the included full function remote control. Riley 47-inch Media Console Electric Fireplace in Espresso With a transitional design with a durable laminate finish in a rich espresso, the Pleasant Hearth Riley media console electric fireplace is sure to be a striking focal point in a living room, family room or bedroom. The 7-inch centre shelf has openings for ventilation and cable/cord management and the adjustable side shelves store media and other small items. The mantel supports flat-screen TVs up to a 48-inch to create a complete media centre. The 23-inch electric firebox plugs into a standard wall outlet and produces a realistic flame and glowing ember effect. It comes with 3 flame settings and 11 thermostatic temperature adjustment that you can control via the LCD back-lit control panel or the included remote control. There is no installation or venting required. Simply plug the unit in and begin enjoying the warmth and ambiance. 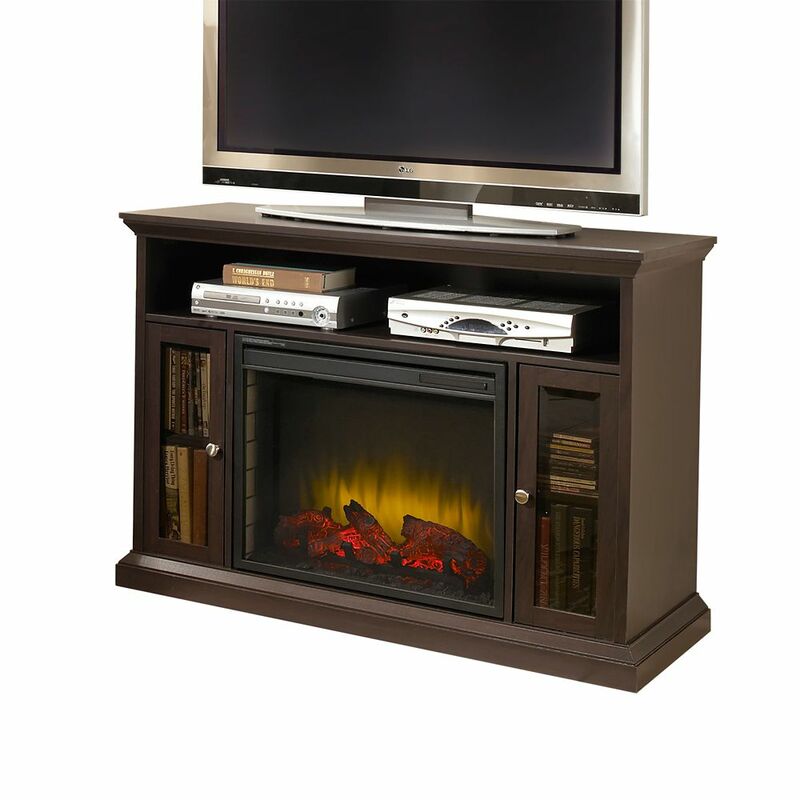 Riley 47-inch Media Console Electric Fireplace in Espresso is rated 4.3 out of 5 by 27. Rated 5 out of 5 by Woody from This took some time to put together, but was worth... This took some time to put together, but was worth it. You can see that it is not real fire, but is still very nice. It also has a feature that lets you warm the area that you are in. Rated 5 out of 5 by Jesus from Arrived in perfect condition assembling instructions booklet is straight forward... Arrived in perfect condition assembling instructions booklet is straight forward was able to assemble the fire place mantel in about 45 minutes. Rated 5 out of 5 by Evelyn from Very nice product....instructions confusing but overall nice product!... Very nice product....instructions confusing but overall nice product! Rated 4 out of 5 by Zteam from Pleased Easy to put together except for the very last door. We had to jimmy-rig the door because the parts fell apart. Nice piece of furniture and will keep my living room warm this winter. Is it made from solid wood?